Steven Clement was born in 1950 in Flint, Michigan. 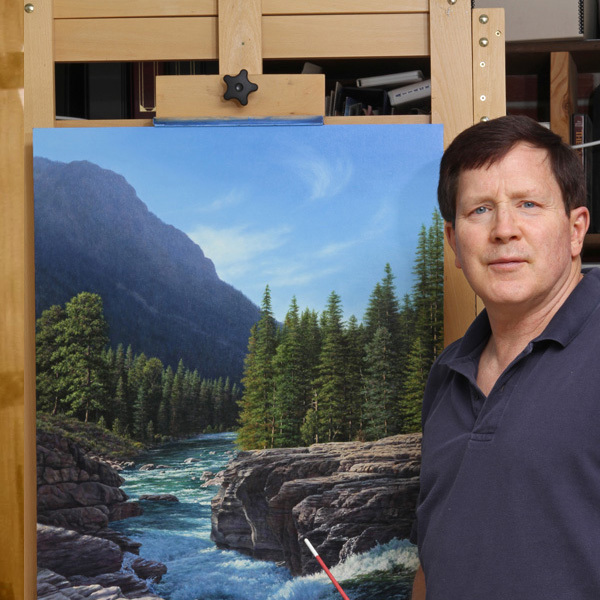 From 1981 to 1985, he was Assistant Professor at the United States Air Force Academy and from 1988-89, developed creativity workshops for home-schooling parents, private schools, and the U.S. Air Force. I have loved to draw and paint since I was a young child, and the awesome wonder of God's creation has inspired me for as long as I can remember. All I ever wanted to be was an artist, but I worked in many fields before finally reaching that goal in 1985. I had come to Colorado five years earlier to teach at the United States Air Force Academy, and I immediately knew the West was where I belonged. The vastness of the skies and their giant cloud formations, the ever-changing appearance of the mountains, and the mystery of the semiarid landscape awakened something deep within me. After hardly painting at all for many years, I started in earnest to capture on canvas the glories of my new home. In 1983, my first group show persuaded me I might actually make a living in art, for all my paintings sold. I left the Air Force in 1985 and have never looked back. Since that time, I have found ever more things that excite me and inspire me to paint. Landscapes still comprise the majority of my work, and I continue to explore the West, seeking new vistas for my art. On several recent trips back East, I have also rediscovered the more intimate beauty that inspired the earliest American landscape painters. In the last decade, I have done many figurative pieces as well. I find nothing more arresting than a well-painted figure. What does the future hold? More landscapes, more figures, and perhaps new subjects I have not yet considered: whatever in my Father's world stirs my artistic soul. I paint primarily because it brings me joy. I paint to glorify my God, who made all of my subject matter. But I also paint to communicate to you, the person who loves art. As an artist, perhaps I see the world a little differently. If you will, it is my task to seek and paint some of the treasures in our world you might otherwise never see, e.g., by hiking for hours by flashlight to see the sunrise in a remote location. It is also my task to notice wondrous things you might overlook in the hectic pace of modern life. These things often arrest my gaze and compel me to do something about them. If I later paint them, be they ephemeral clouds or graceful trees or fascinating people, then you may, when you see them in my paintings, contemplate these things more than if you simply brushed past them in the real world. You may thus begin to behold our marvelous universe with a greater sense of awe and wonder. If you do. you will live with more passion, and perhaps even more compassion. You will see things and people in a new and richer way, for you will be more alive to your world. This is one of my greatest possible services to you as an artist. As is apparent from my work, I am not trying to create something shocking or novel or to start a new art movement. I am not a visionary or a prophet attempting to show you the future. Rather, I am an artist, and I hope to use my artistic vision to expand your vision and enrich your life. And if that happens often enough, it may indeed change the world. With some reluctance, I have included a listing of prominent corporate and institutional collectors of my art. (Not included are the dozens of leaders of these organizations who have my paintings in their personal collections.) Such information may assist you if you are just beginning your collection or if you are considering the work of an unfamiliar artist. You can also obtain invaluable information from art books, knowledgeable gallery owners, art museum staff, and artists themselves, not to mention from studying lots of fine paintings. Ultimately, however, you should trust your own judgment and buy what you love. Your tastes may change over time, but if you collect what moves you, you will not go far afield. With these thoughts in mind, it is usually best not to think of your art acquisitions as serious investment vehicles unless you are that rare person with a thorough knowledge of the art market and pockets deep enough to afford the works of established masters. Instead of looking for the best investment, buy what you love. If the market agrees with you, fine. If not, you still have what you love. Also, collecting art should be fun; it should bring you joy. If you feel stress, something is wrong. The only time you should feel stress in the art world is when you are walking away from a work you really want or paying for a work you really do not want. Studiously avoid both. Finally, whether you collect many art works or only look at them in museums and galleries, my wish for you is that you will become richer in heart and soul.